RANDOM: ZURIARTS "The Fairy Tears"
ZURIARTS is quite a productive band, but this is my first encounter with them. "The Fairy Tears" is a single release with a couple more unreleased tracks to justify the $$$ you're parting with to get a copy, which is a very nice gesture indeed. 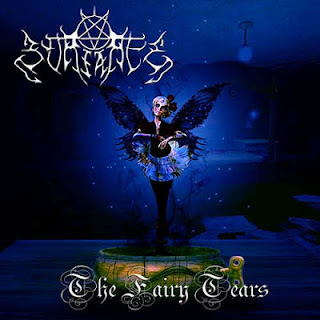 "The Fairy Tears" is probably the band's latest material to be released, and from this single song ZURIARTS seems to play melodic death/black Metal with compulsory necro vocals. And of course with eastern Metal traits clinging on like a virus. Highly melodic is the song throughout the entire length. Fortunately there's a remastered song from the first demo included, with what little I have here I'll try to make the comparison between these two. "Dead To Hell", the song from the first demo back in 2006, sounds more aggressive when compared with "The Fairy Tears". In fact it made me conclude that ZURIARTS are less black Metal nowadays than before, and if you listen to the minus one here which is included as well, the song did not sound black Metal at all without the vocals. It's a melodic eastern death Metal composition. Will the black Metal tendencies vanish from now on? That is to be determined when the next release come out. But the melodic aspect is everpresent in their Metal, that's for sure. A DESASTER cover 'Expect No Release' to complete the track list here.